A battle between two burger royales takes center stage in the latest edition of our Better Buy series. Shake Shack (NYSE:SHAK) and Habit Restaurants (NASDAQ:HABT) typify the better-burger and fast-casual trend that has taken over the restaurant industry in the last decade. Unlike traditional fast-food mavens like McDonald's, Habit and Shake Shack serve fresh beef and burgers that are made to order. The higher quality warrants a higher price tag, and the movement has been successful as a number of other better-burger shops have also proliferated including Five Guys and Smashburger. As stocks, however, Habit and Shake Shack have not been so successful. Both debuted around the same time (Habit in November 2014 and Shake Shack in January 2015), and are trading below their opening price on their IPO day. As the chart below shows, shares have been giving investors an upset stomach. Still, both companies are growing fast and continue to outperform the overall industry. The sell-off over the last two years could also present opportunity. Let's take a closer look to see if either of these stocks has much to offer investors. Shake Shack's outsized brand may have led the stock to soar in its initial months on the market. Founded by famed restaurateur Danny Meyer, it built a reputation for delicious burgers and shakes with just one kiosk in Madison Square Park. Its average unit volumes, at around $5 million, are much better than any other fast-food chain, though management expects that number to moderate over time. While Shake Shack has successfully executed its growth plan during its two years as a public company, accelerating its new store openings and beating analyst expectations in almost every quarter, expectations may have simply been too high. Even today, with shares trading near a 52-week low, the stock is valued at a P/E of 61, a lofty multiple for a restaurant chain. However, though its torrid performance from 2015 has slowed, Shake Shack is still looking strong. At a time when the overall restaurant industry has seen comparable sales fall, its same-store sales ticked up 1.6% in its most recent quarter and revenue jumped 43.5%. However, Shake Shack has struggled to absorb higher labor expenses as company-operated restaurant margins shrunk 280 basis points to 25.4%. While increased labor costs could hamper bottom-line growth over the next year, the long-term picture still looks strong as the it moves toward its goal of 450 company-owned stores nationwide. Like Shake Shack and other fast-casual stocks that have IPO'd in recent years, Habit debuted with high expectations. However, growth has fallen short over the past two years and the stock has crashed along with it. While Habit continues to expand from its California base, profits have been scant as adjusted pro forma net income for 2016 was just $8 million, or $0.31 per share. That number was only modestly better than 2015's EPS at $0.29. Comparable sales continue to improve at Habit as they increased 1.7% in both the fourth quarter and for the full year, though traffic actually fell for the full year as a price increase was the reason for the increase in comps. Still, it just completed its 52nd week of positive same-store sales, a streak that's virtually unmatched in the restaurant industry, and a testament to the company's consistent growth. Revenue grew 23% last year, but profit growth was slower due in part to increased labor costs as well, which ate into restaurant-level operating margins. Looking ahead to next year, the company expects to increase from 16.7% to 20%, which could help profit growth improve. Who's got the tastier burger? Both stocks have struggled historically and are valued about the same, as Habit carries a P/E of 60. 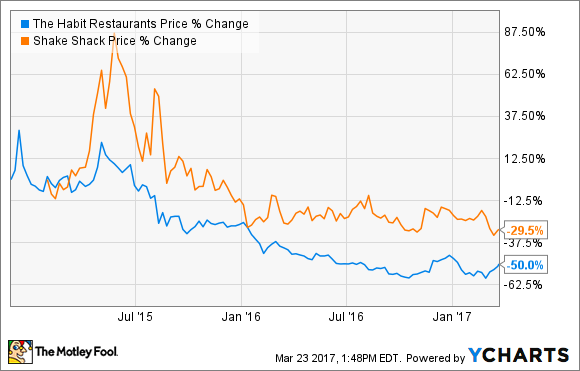 Of the two, however, Shake Shack has a much better long-term outlook. The company has a stronger brand and outperforms Habit, based on key metrics such as average unit volume and restaurant-level operating margin. Shake Shack, with only 64 company-owned restaurants, has only just begun on its path to 450 locations. Habit, on the other hand, has more than double the number of restaurants but equal the revenue and less profit. Until the company can demonstrate it can grow profits at least as fast as revenue, the stock is likely to remain mired in the teens.